The secret to why R2D2 is so popular in the rebel alliance for a walking lightsaber holder? He also holds the beer. And who doesn't like seeing beer arrive? With a turntable head that D.J. C3PO can spin (hence the rigid elbow joints), the two droids area complete party system for the solar system. Trying their best to create another reason to love the little guy even more, are Cakes Cove who made this life-sized replica out of yummy, delicious, looks like chocolate but could be any flavour cake. Now don't worry how they define life-sized from a fictional character, just try mastering that Jedi mind trick Luke used to pull R2 from the swamp and get a slice to fly this way. I'm starved. 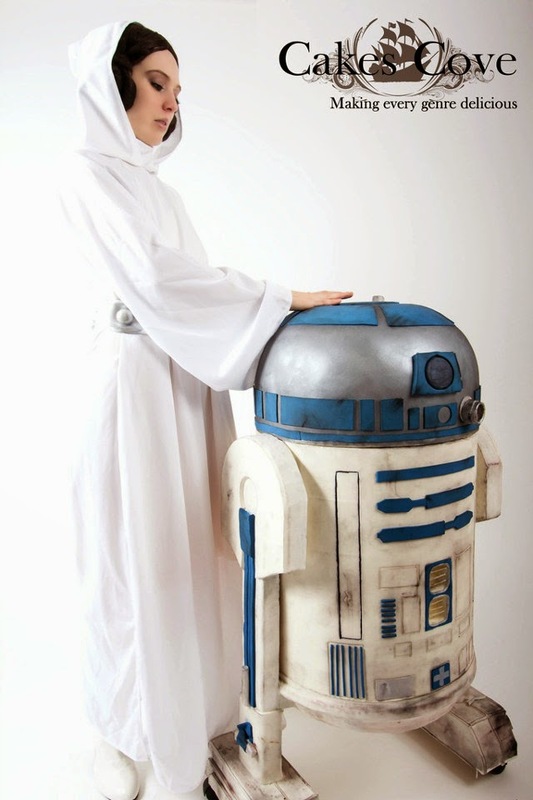 Just think of all the Star Wars themed weddings...instead of the little people on top, R2 could emit a hologram of the couple! Thanks folks! I say if that's the size of the cake I'm going to need a bigger fork!